View lead/contact details from Salesforce CRM during an ongoing chat. During a chat session, manually create leads/contacts in Salesforce CRM. 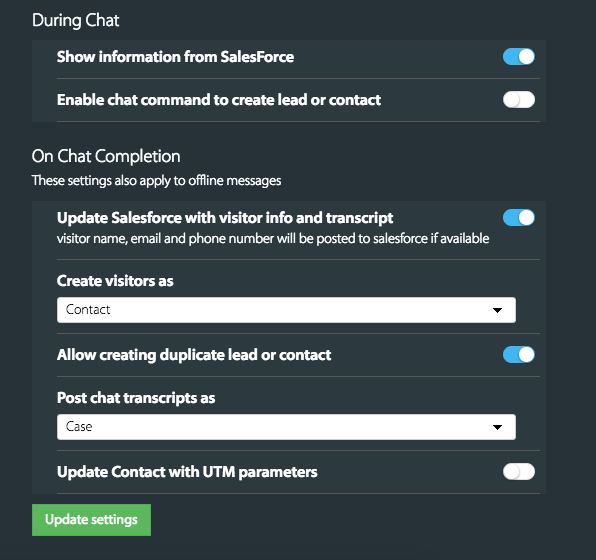 After a chat ends, automatically create leads/contacts in Salesforce CRM. Create multiple leads/contacts for a customer during a chat or after chat ends. Add the chat transcript to each lead/contact once the chat ends. Capture UTM parameters from the URL and update it to a lead/contact detail after chat ends. This integration is available in Fantastic and Enterprise plans. Email or Phone number is a must for a contact/lead to get created on Salesforce. Step 2: Go to Apps → Salesforce CRM → Click INSTALL/TRY FOR 7 DAYS button. Step 3: Click Connect button and you will be prompted to grant access for integrating HappyFox Chat with Salesforce. Click Allow. On successful connection, you will see the message below. Step 4: Update your preferred settings under "During Chat" and "On Chat Completion". Let's consider a scenario where you want to create Lead after the chat ends. If the Setting is, Create visitor as Lead even though the visitor exists as contact is ON andAllow creating duplicate lead or contact is ON. Case 1: If only a Contact exists → A new Lead will be created. Case 2: If a Lead exists already → Another Lead will be created. If the Setting is, Create visitor as Lead even though the visitor exists as contact is ON and Allow creating duplicate lead or contact is OFF. Case 2: If a Lead exists already → The chat transcript will get updated to the recently added Lead's /Activity or Note. If the Setting is, Create visitor as Lead even though the visitor exists as contact is OFF and Allow creating duplicate lead or contact is ON. Case 1: If only Contact exists → The chat transcript will get updated to the Contact's case/Activity or Note. Case 3: If a Contact and Lead exists already → The chat transcript will get updated to the Contact's case/Activity or Note. If the Setting is, Create visitor as Lead even though the visitor exists as contact is OFF and Allow creating duplicate lead or contact is OFF. Case: If a Lead exists already → Another Lead will be created. Case: If a Lead exists already → The chat transcript will get updated to the recently added lead's Activity or Note. Case: If a Lead exists already -> Another Lead will be created. You can map the UTM parameters to the fields in Salesforce. Once the chat ends, the UTM values will be posted/saved to the mapped salesforce fields. The mapping list will display only the fields that are of datatype = TEXT. (To see the datatype of your Lead fields in your Salesforce account, go to Setup → Customise → Leads → Click Add a custom field to leads). Step 5: Once you add your preferences, click Update Settings and you are all set! 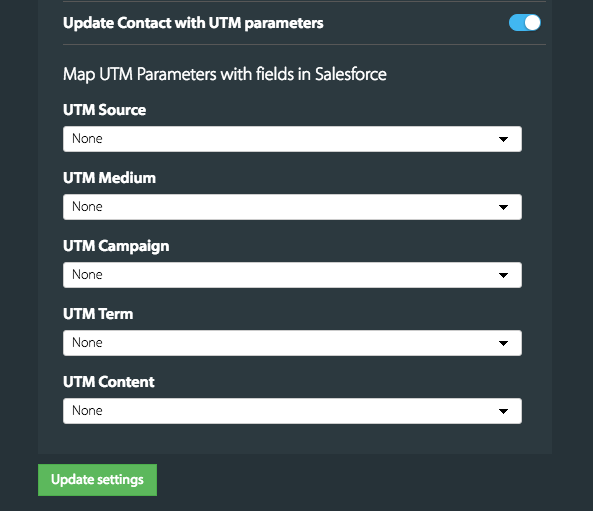 NOTE: If you want the UTM parameters to be mapped to a field other than the ones that are listed in the dropdown, you can create your own custom field in your Salesforce account. 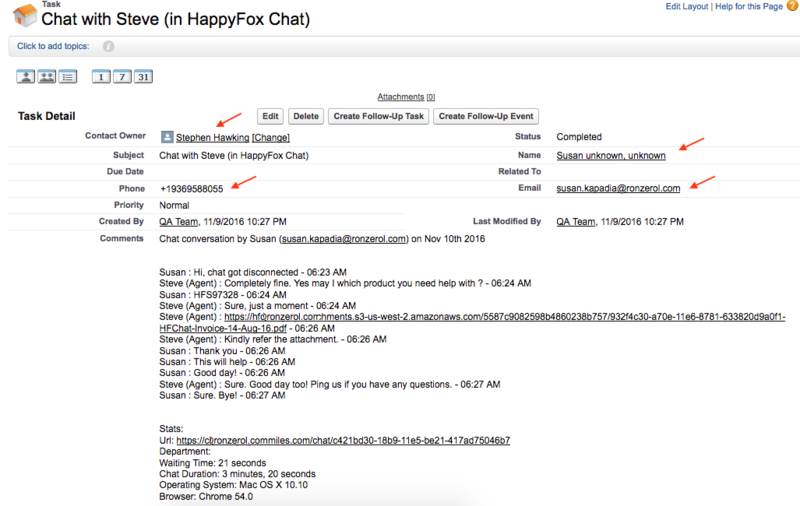 Those custom fields will get listed under your HappyFox Chat account's- Salesforce integration UTM settings. Click Setup → Click Customize under Build → select Leads → Related Lists. Drag and drop Notes & Attachments to the Layout. 1. 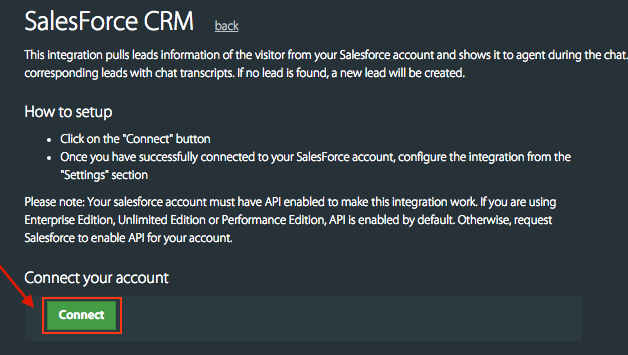 View customers' lead or contact details from Salesforce CRM.On clicking the lead/contact, you will see the lead details in chat information box as shown below. 3. Option to allow creating duplicate leads/contacts for the same customer during a chat. Even if you have created lead during the same chat. 1. After a chat ends with a new or existing customer, leads/contacts are created on Salesforce CRM automatically. a) This lead/contact will be assigned to the staff who handled the chat if the same staff with same email id is present on Salesforce account. If not, the created lead/contact will be assigned to the person whose email id was used for integration (SFDC administrator). 2. Add the chat transcript as notes or activity or cases to each lead/contact. 3.Capture UTM parameters from URL and update to a lead or contact detail in Salesforce CRM.